The Liberal government’s key 2015 election commitments included renewing the nation-to-nation relationship with Indigenous Peoples, and committing to the 94 calls to action of the Truth and Reconciliation Commission. There were vows to transition away from the Indian Act, through a new approach to recognizing the inherent rights of First Nations. But as the next election approaches, how much meaningful change has actually occurred in this critically important policy area? Has there been movement forward in fundamental areas such as restoring Indigenous land and implementing the United Nations Declaration on the Rights of Indigenous Peoples? What is the state of Indigenous-Crown relations? Join us for a conversation moderated by Jennifer Ditchburn, editor-in-chief of Policy Options magazine. K̓ÁWÁZIⱢ (Marilyn Slett), Citizen of the Heiltsuk Nation and the elected chief of the Heiltsuk Tribal Council for a third consecutive term. Brock Pitawanakwat, An Anishinaabe from Whitefish River First Nation, associate professor and program coordinator of Indigenous Studies in York University’s Department of Equity Studies. Emily Riddle, a nehiyaw (Plains Cree) writer, researcher and policy analyst from Treaty 6 who currently lives in Vancouver on the territories of the Musqueam, Squamish and Tsleil-Waututh peoples. Jennifer Ditchburn, Editor-in-chief of Policy Options, the IRPP’s influential digital magazine. K̓áwáziɫ (Marilyn Slett) is a citizen of the Heiltsuk Nation and the elected chief of the Heiltsuk Tribal Council for a third consecutive term. She previously served as tribal councillor and executive director of the Heiltsuk Tribal Council. She is also currently the president of Coastal First Nations, on the board of directors of the British Columbia Assembly of First Nations, the co-chair of the Wild Salmon Advisory Council to British Columbia and was recently appointed to the Vancouver Coastal Health board of directors. During her time as chief, she has guided the Nation on many major endeavours focused on protecting Heiltsuk title and rights and British Columbia’s marine health. Brock Pitawanakwat, Associate professor and program coordinator of Indigenous Studies in York University’s Department of Equity Studies. Dr. Brock Pitawanakwat, an Anishinaabe from Whitefish River First Nation, is associate professor and program coordinator of Indigenous Studies in York University’s Department of Equity Studies. Current research interests include Anishinaabe electoral participation, governance, health and language revitalization. 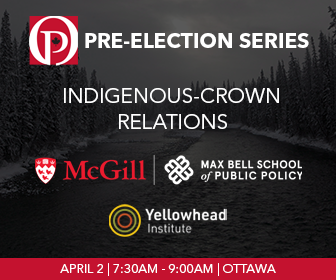 He is a research fellow with the Yellowhead Institute and a regular panellist with Media Indigena’s weekly round table. Emily Riddle, writer, researcher and policy analyst from Treaty 6, member of the board of advisors of Yellowhead Institute. Emily Riddle is a nehiyaw (Plains Cree) writer, researcher and policy analyst from Treaty 6 who currently lives in Vancouver on the territories of the Musqueam, Squamish and Tsleil-Waututh peoples. She has worked with First Nations and Métis communities on diverse policy development and governance projects and communications campaigns. She is a member of the board of advisors of the Yellowhead Institute. Jennifer Ditchburn is the editor-in-chief of Policy Options, the IRPP’s influential digital magazine. An award-winning journalist, she spent more than two decades covering national and parliamentary affairs for The Canadian Press and for CBC Television. She is a three-time winner of a National Newspaper Award and the recipient of the prestigious Charles Lynch Award for outstanding coverage of national issues. She is the coeditor (with Graham Fox) of The Harper Factor: Assessing a Prime Minister’s Policy Legacy (2016).